Peterborough Panthers number one Craig Cook has refused to put himself under any pressure ahead of the British Final tonight (June 13). 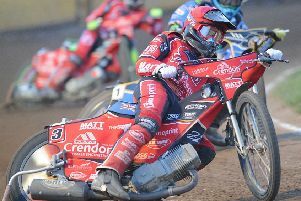 Cook will start as one of the favourites for victory at the National Speedway Stadium in Manchester - a venue which is his home track in the Elite League with Belle Vue. The 29 year-old has finished as runner-up in the last two years to Tai Woffinden, who has chosen not to take part this term. Cook said: “I’d love to win the British title, but I’m not going to put myself under any pressure at all. And Cook insists he is disappointed that Woffinden will not take part - even though the world champion’s absence appears to improve his own chances of glory. “If you are going to be British champion, you want to beat the best riders,” continued Cook. Cook did lead Woffinden in the final last summer until the race was halted after Coventry man Jason Garrity crashed. Woffinden then won the re-run. Cook also worked his way through to second, behind Woffinden, the previous year. Both of those meetings were staged at Wolverhampton. BRITISH FINAL DRAW: 1 Josh Bates (Coventry/Sheffield), 2 Steve Worrall (Belle Vue/Newcastle), 3 Craig Cook (Belle Vue/Panthers), 4 Danny King (Coventry/Ipswich), 5 Josh Auty (Leicester/Scunthorpe), 6 Simon Stead (Sheffield), 7 Ben Barker (Coventry/Glasgow), 8 Richard Lawson (Lakeside/Glasgow), 9 Scott Nicholls (Belle Vue), 10 Paul Starke (Leicester/Somerset), 11 Richard Hall (unattached), 12 Robert Lambert (King’s Lynn/Newcastle), 13 Chris Harris (Coventry), 14 Richie Worrall (Belle Vue/Glasgow), 15 Jason Garrity (Coventry/Sheffield), 16 Kyle Howarth (Wolverhampton/Sheffield). Reserves: Charles Wright and Lewis Kerr.